I think you added support for importing wholesale price. Can’t find on csv proper way to import mass wholesale prices. Please let me know what the heading for the csv should be. 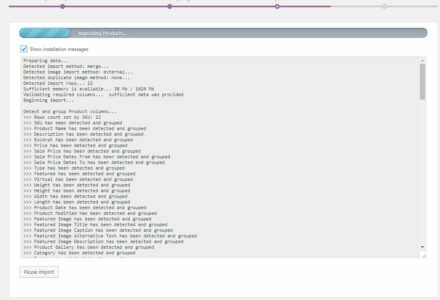 Hi Anthony, I’ll update the CSV’s now with additional information and a better explanation of the differences in each. 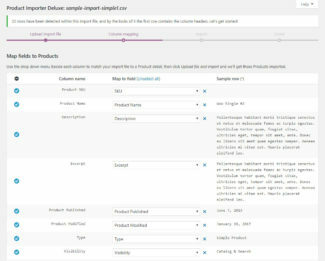 Is it possible to import a product into multiple categories? Hi Andreas, sure does. Just use the Category separator character; defaults to ‘|’ (pipe). 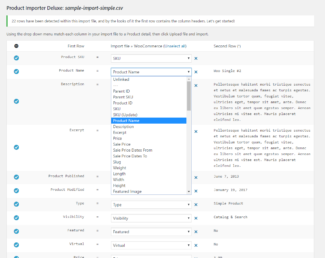 Take a look at the sample CSV’s above for more information as well as how to use Category hierarchies within the Product Category field. 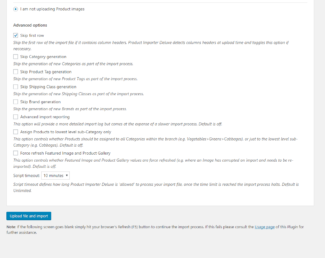 I’m still unable to import using your plugin, or even look at the Products section of my dashboard, without getting a Server 500 error. 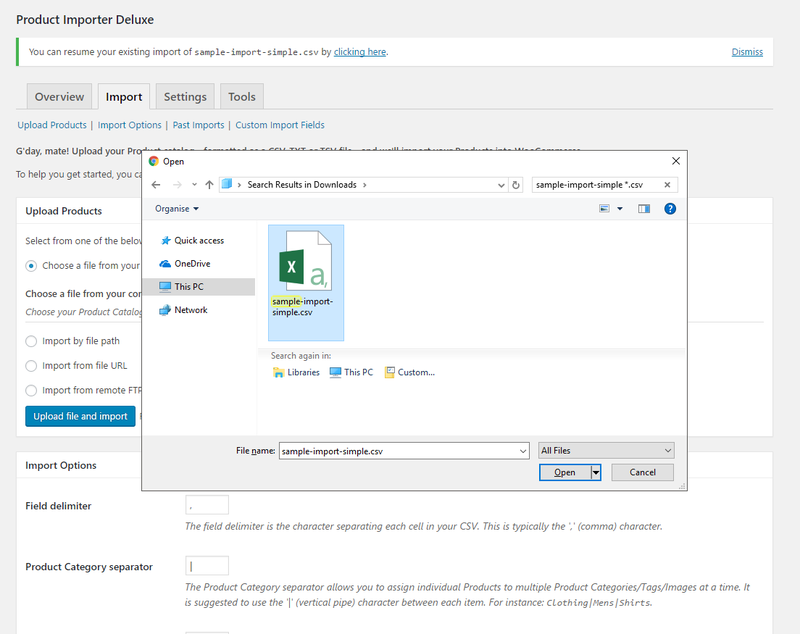 I’ve just upgraded both WP-Ecommerce & your Deluxe Importer to the latest versions (3.8.8 & 3.1.1 respectively), but still no change. 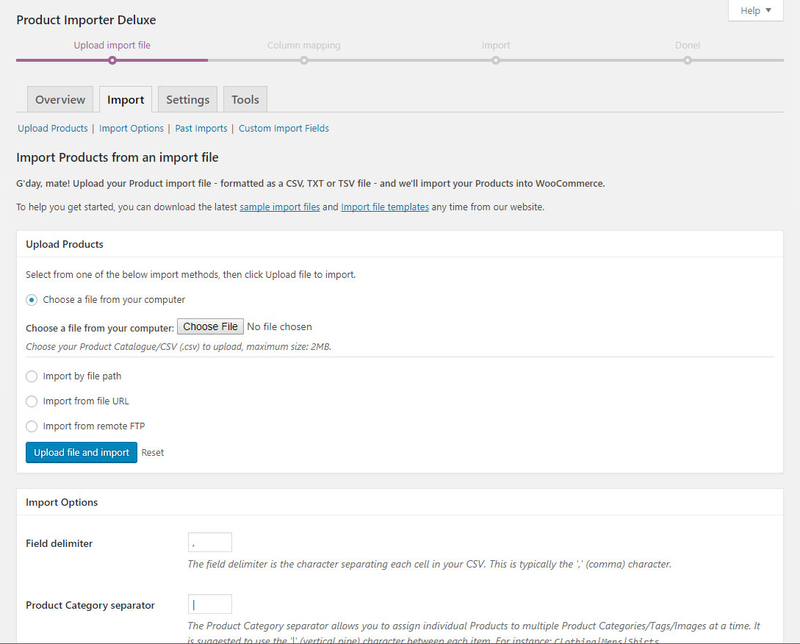 How can I delete all my products without accessing the products section of the dashboard? I’m sure this is the only way, although of course if I then still can’t import, then I’m in trouble! But currently all my products are so out of date anyway, that many of the orders I’m getting are for out of stock items anyway! 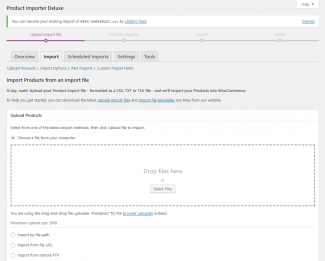 Also, I have emailed you regarding switching to Woocommerce – could you please get back to me on that? Hi Paul, have replied to your e-mail. 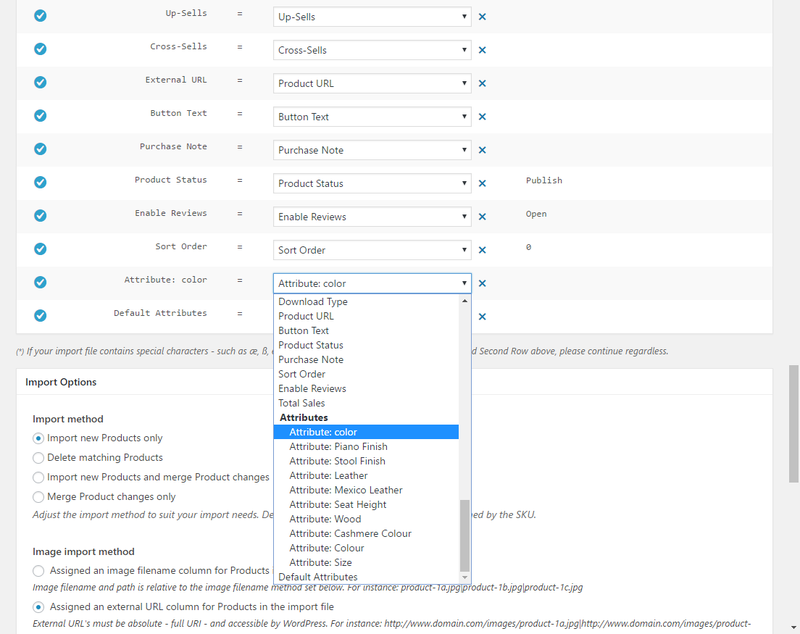 To delete your Products outside of WP Admin you will need to manually dump your Products via phpMyAdmin to free up enough memory, you can do this as below. Do note this will leave any post_meta and other links around, I recommend running a database clean up within WP Admin after this. I can’t find a way for it to support an encoding with latin characters. Hi Pedro, thanks for attaching that. I’ll reproduce this and update you. Anybody else getting this error that shows up on your product page? I can’t remove it by editing the product. Nobody else is having this issue???? 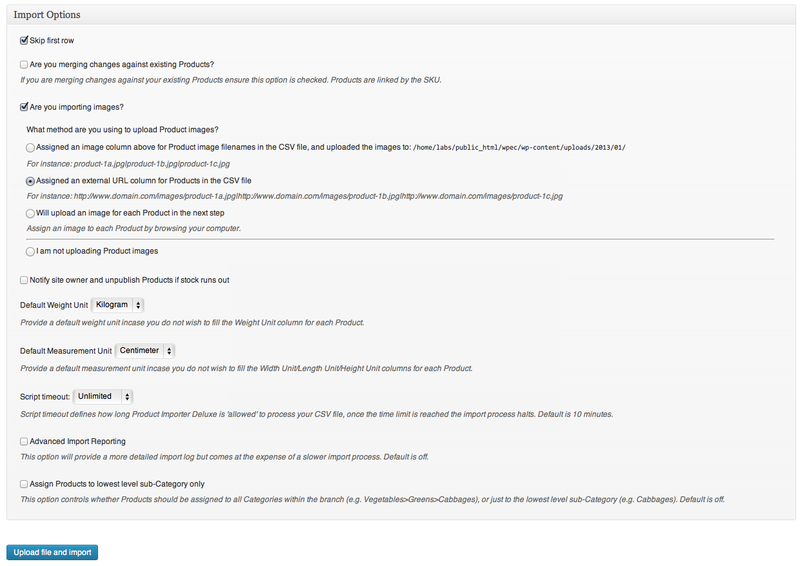 Hi Steve, this is resolved in the 1.2.5 Plugin update hitting Jigoshop momentarily. 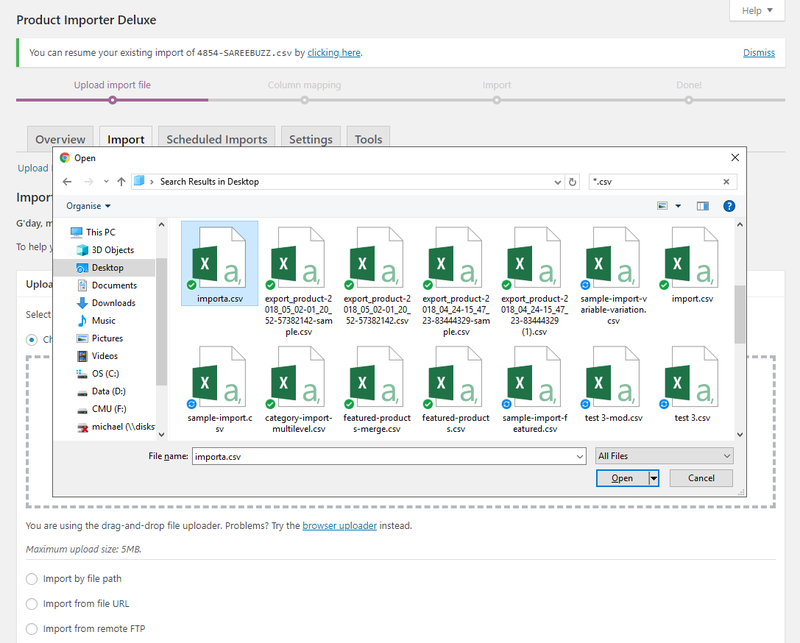 Hi guys, can you confirm if you are importing Attributes as part of your bulk import. This will help me narrow down if this is responsible for the warning. Yes, I’m having this problem as well and all my products were part of a rather large bulk import. It dosen’t seem to matter. One site I did not import any attributes. 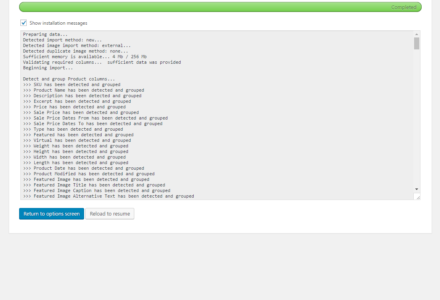 But then another site I started I used your sample data files and the same thing happened. 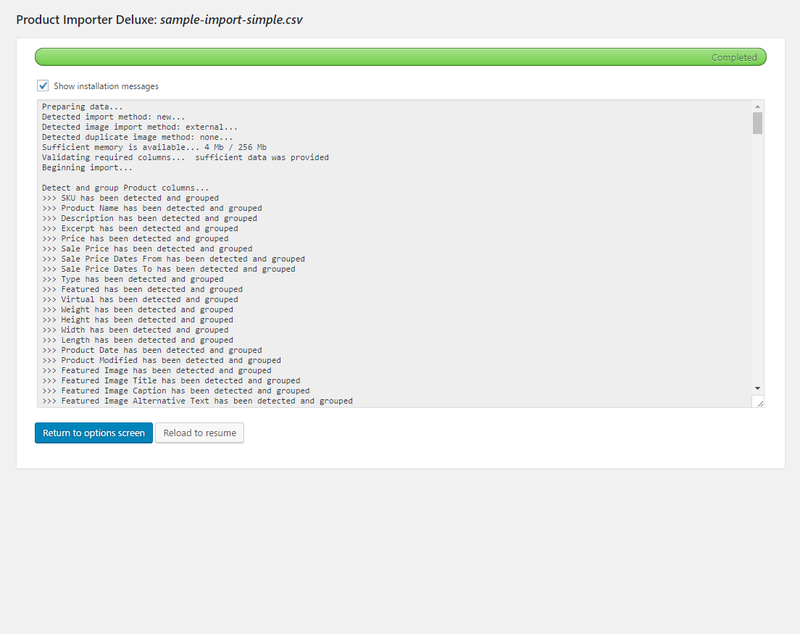 I think I found my issue: I can not set a CSV field to ‘Attributes’, it is simply not in the drop down list. I downloaded the ZIP file from Jigoshop again, and the date modified on all the files March 23. Isn’t there a newer version? And would a newer version also fix my issue with all the Tags being created, but only one Tag is saved to the product (when it has multiple tags)? Jigoshop emailed me the current version but it did not solve any of the issues..in fact now the image field does not update on merge either! 1). Still same issue with Attribultes admin tab. 2) The single product page does not display properly until I have manually edited and saved the product. 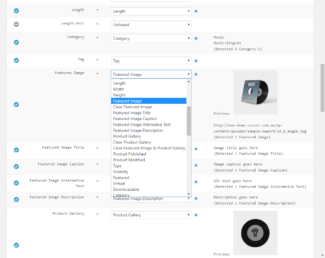 3) Only the first tag is being set for a product. 4) Image field does not import or update properly. (I have only tried external url) – this was working in previous version, but since update my test imports have no images. I am getting really frustrated and I’m weeks behind on a project. I really need a version that works properly. 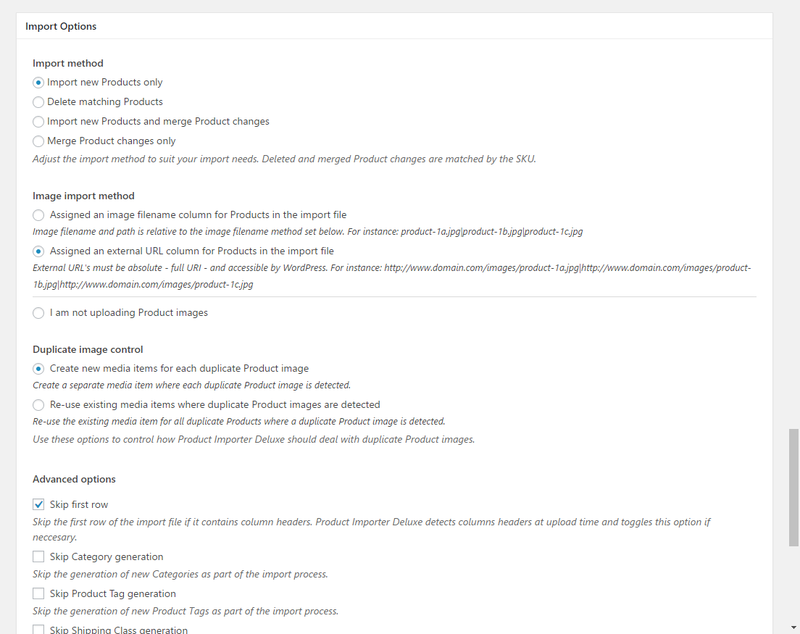 Hi TairaK, I’ve just responded to your Jigoshop support topic, you’ll be receiving a Plugin update that sorts the Attributes, Tags and image import issues shortly. Alright, version 1.2.5 is getting closer…. 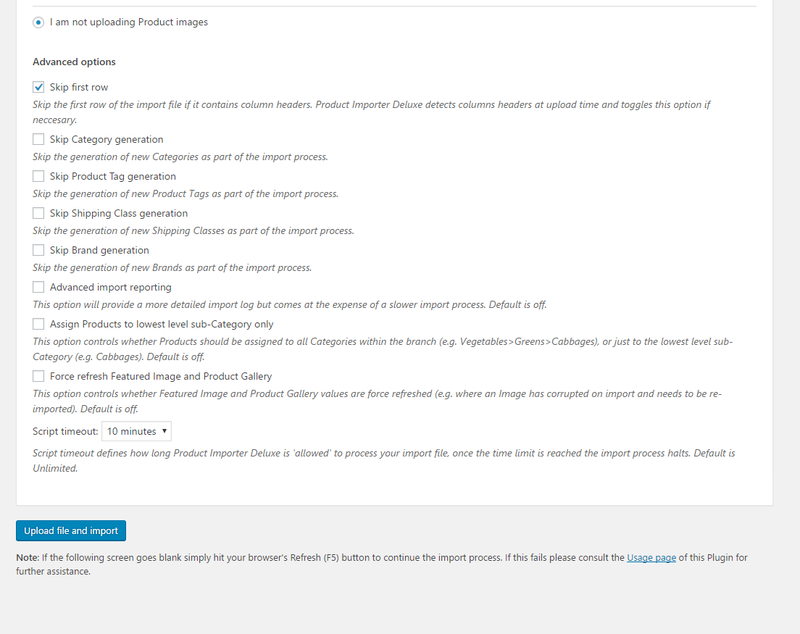 2) Re-uploading a product (merging) causes the Featured Image to be deleted from server – yep, the whole thing is wiped right off the server. This obviously is a big concern!!! 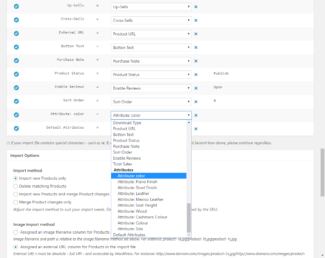 3) Still no option in drop down to assign field to Attribute (although I do not need this, others might). Thanks for the support. I am beginning to have faith in this product again. I am so close to being able to bill for two projects once the image issue is addressed. 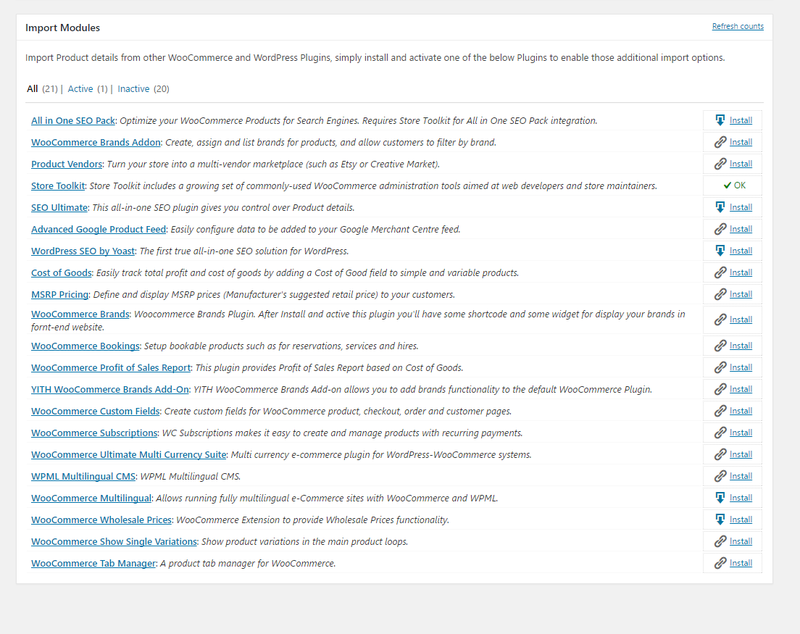 Is it the All in One SEO Pack found in the wordpress plug-ins or is there a different one just for jigoshop? 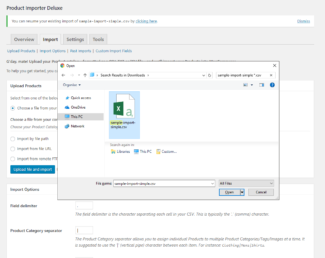 Hi Steve, this Plugin integrates with the official AIOSEO Plugin. 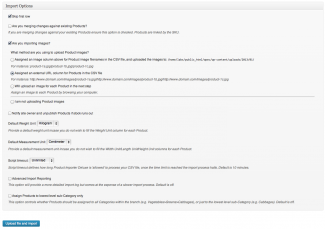 You will need both the Plugin available on this site and AIOSEO for integration with Jigoshop. Thanks, all set up and running. 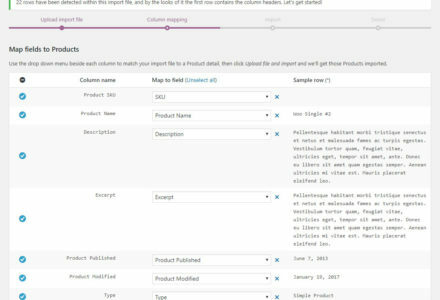 Can I load a CSV with sku, name, category, price and qty and in doing so update the qty and or category of existing products? When I do such an upload, it appears to scan for name changes, but not category and qty. My primary issues is attempting to update 400 out of stock items at once. I was attempting to set Qty to 0, but the Qty is ignored in the upload. Hi Lucas, there’s a Plugin update going out today that fixes a bug in the merge of Stock Quantity. Currently a ‘0’ (zero) value is detected as false when merging and is skipped/ignored during merging, this is fixed going forward. Ok, thanks for the tip where the docs are. Feel dumb for not seeing them, but I uploaded the plug-in and didn’t look inside. My bad. Do you have any intention of supporting this premium plugin? There are no detailed instructions on how to use this. Your bullet items following the above statement that these are “clear step-by-step instructions” is laughable by any standard. 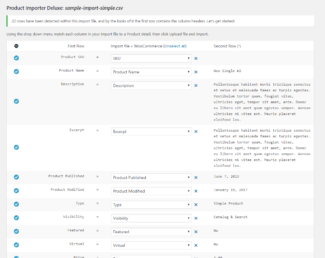 For example, if I want to import images for my products then what should be placed in the image field of the CSV file? Up to now I have learned a few things about this utility through trial and error time that I don’t believe I should be forced to complete. 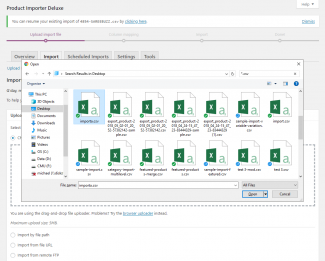 Why would I get error messages about duplicate SKU’s in my import file when there are no duplicates and it is the first time I have tried to import the the records. 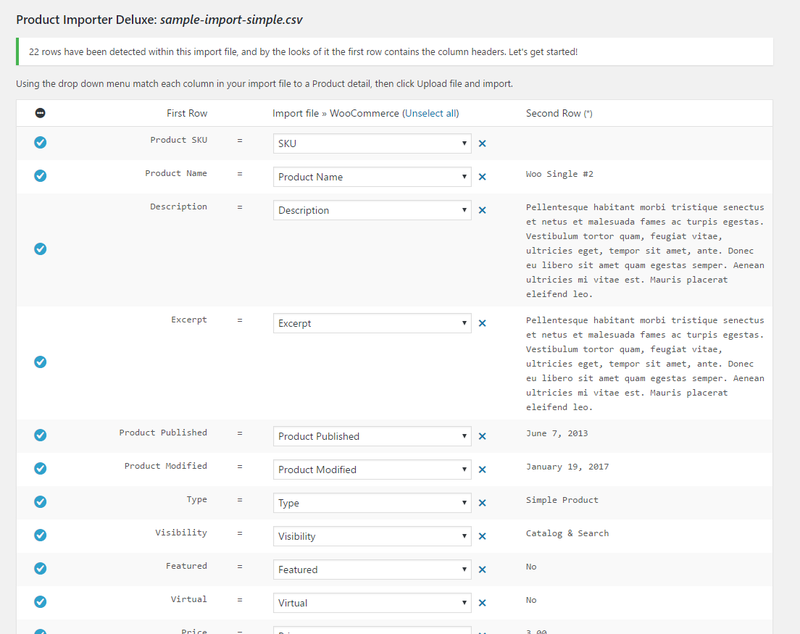 I have successful imported other products with my SKU’s using the same format for the CSV file. I am highly disappointed in what I received in this premium this plugin. You should get with it or make this a free plugin. Anybody, what am I missing here? Hi, I bought your product importer today. I had already uploaded all the images into the media library via the media uploader & I check in the content/uploads file that they were also there. 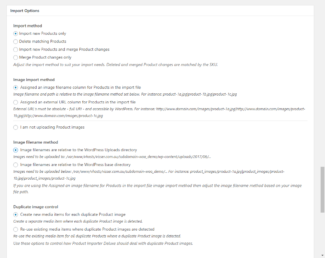 However, when I do an import it does not connect the images to the products. The product shows as having no image. 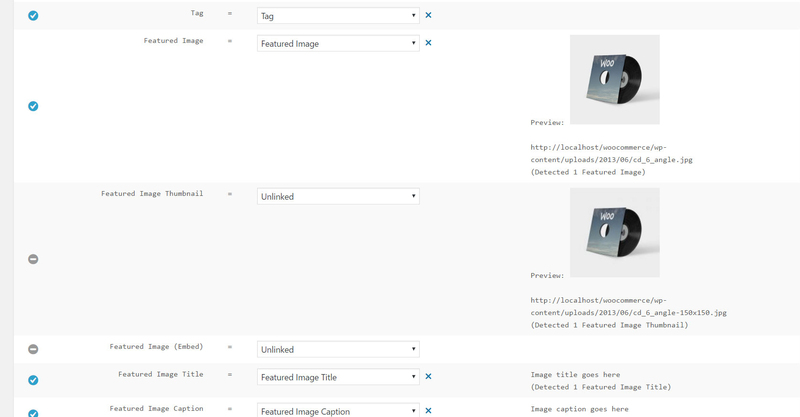 I’ve checked the image column on the csv & all the image codes match those in the media library. Do you have any idea why this might be or what I may be doing wrong? Hi Rachel, a Plugin update is going out today which improves the image import functionality. 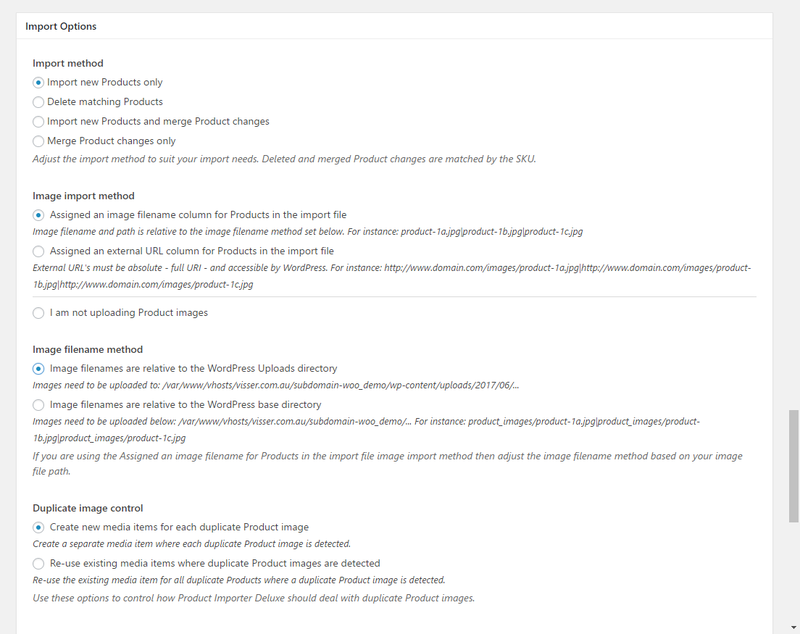 I have disabled the duplicate Image detection in this latest release as it has been causing the ‘unlinked Product image’ issue you’re likely experiencing. Please download the latest release and confirm if this is still occurring. 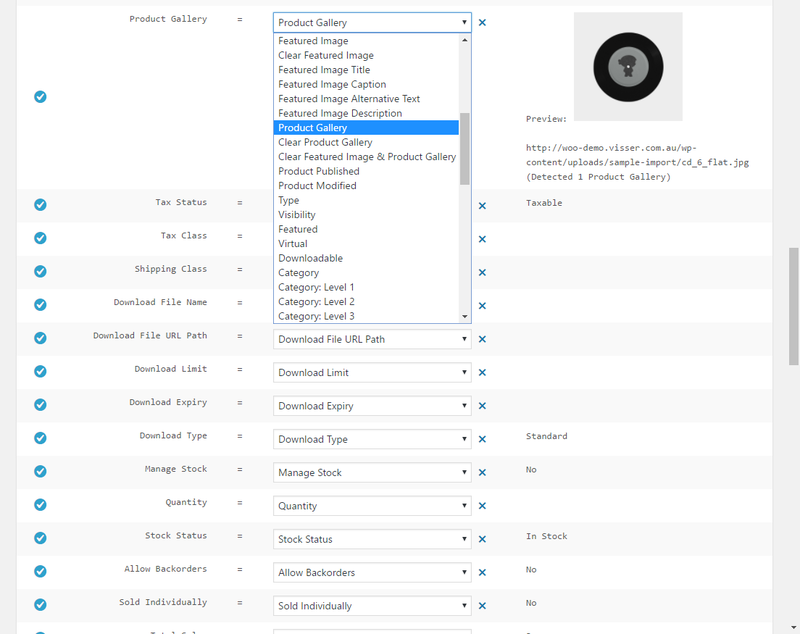 Please note that Product Importer Deluxe will only detect Images that have been uploaded in the current month else if you have turned off Media indexing from Settings > Media, the duplicate image detection above scans your entire Media Library but needs a bit more love before it’s reintroduced. Thanks for your reply on that. I will download the latest version now & see how it goes. I just wanted to check on one thing first though as I think I failed to do something before; do I have to go into the csv file & change all the image names to the file they can be found in? Is that correct? Or can I just change it at the column title? 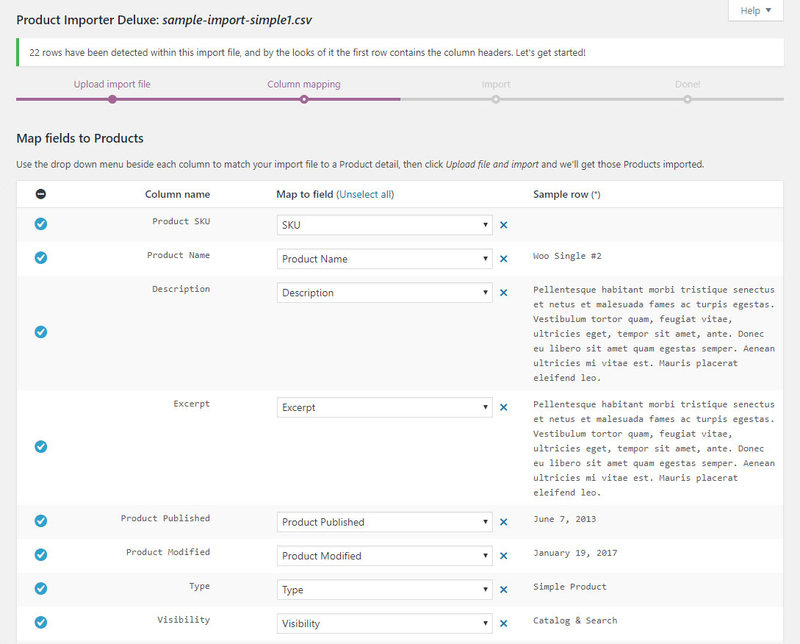 I have a question regarding exporting products – you supplied a sample csv and that was great to start with, but now I have edited a whole bunch of items on my website and I want to export the entire product items in the same structure as your sample file so that I can make some changes and import them back in…..
How can I export the products ? 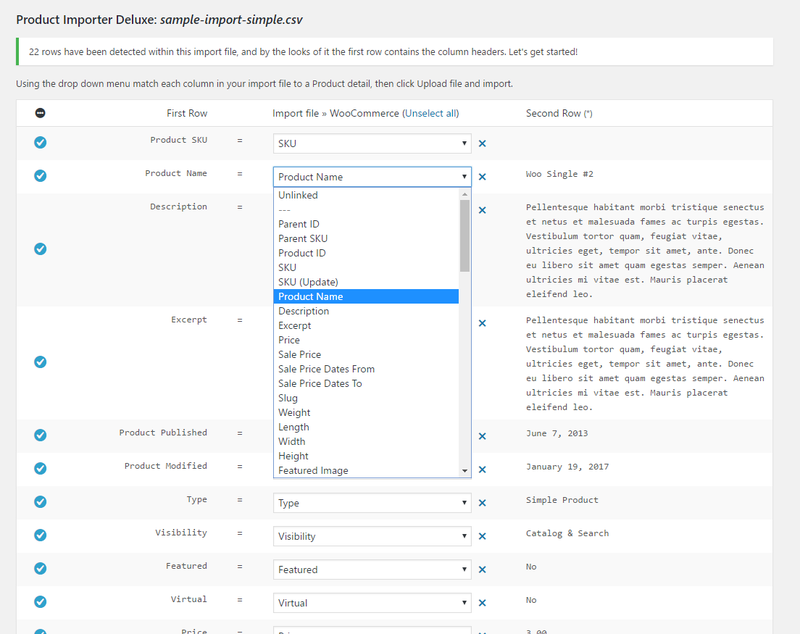 Hi Emanual, download my Store Export Plugin and select the Products item from the list. No support, no funcionality, no explain, no nothing, just $50 for nothing, Smart Manager Pro do all this, have GUI, works better and give support to their clients, if you can’t do it alone Michael, dont do it, dont sell your plugin if you cant tell people how it works, you only answer questions of people asking if they should buy it. too expensive Mr. Michael. 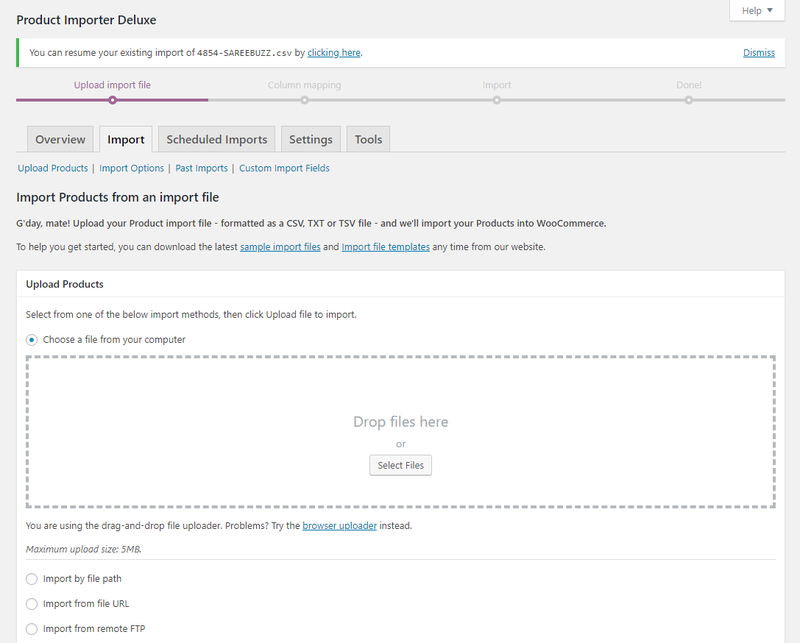 Hi Lucas, I’m packaging up a major Plugin update to work out the critical import issues affecting the WooCommerce release and will be sending this to the WooThemes team shortly. When you think it will be available? 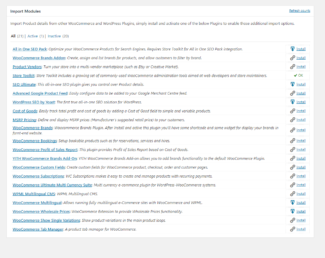 Hi John, the 1.2.4 Plugin update was sent to WooThemes today for distribution so I hope any day now! Ok, one last problem. I can’t seem to get the featured image to work. I have the full url in the image field, but after uploading the featured image is not showing up. Any ideas??? 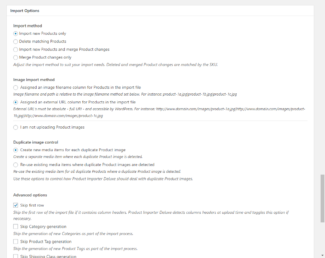 Hi Steve, I’ve improved support for importing Product images. Please download the new 1.2.4 Plugin update going out today. Where can I get the new version? I have purchased the older one and am experiencing the same issues as mentioned here. 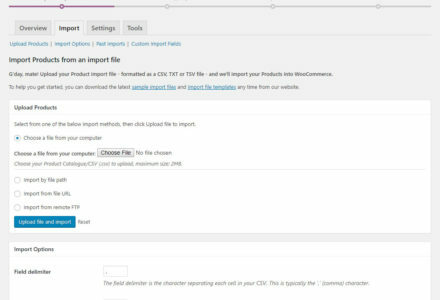 If I buy this, will this importer able to handle CSV file which exported with your Exporter plugins? 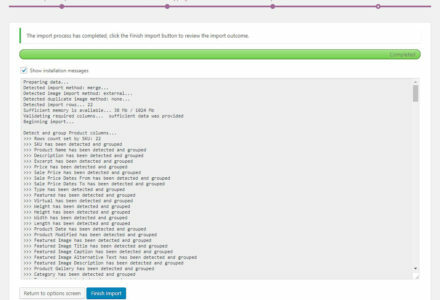 Many thanks for the answer, Visserlab.., but I just tested your Exporter module today… and I found that it hasn’t been updated. 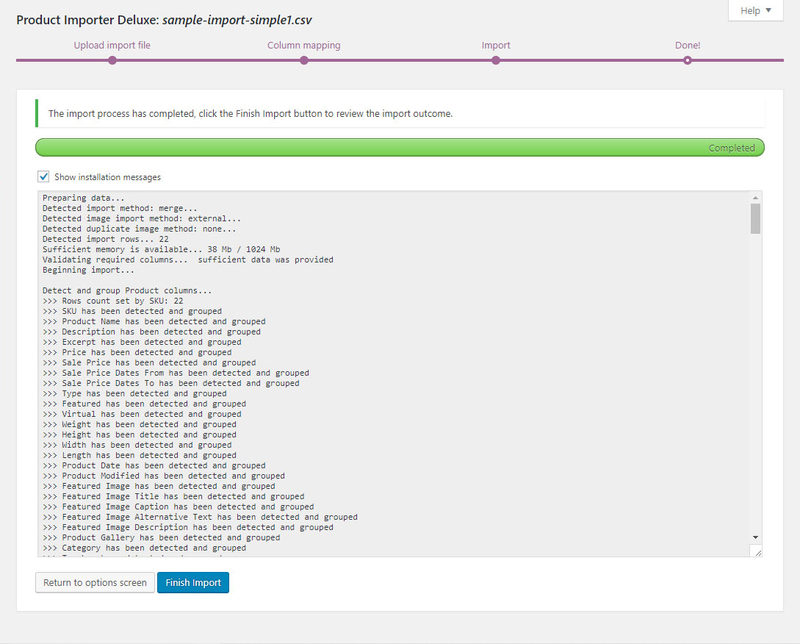 That exporter doesn’t work well with the latest version of WooCommerce.